Jamie's general research interests and efforts are focused on the use of molecular and morphological systematic techniques to identify mollusks, myriapods and crustaceans and to document their distribution, diversity, natural history, and biological information. 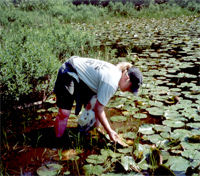 She began her journey in marine biology, but has broadened her scope to include freshwater and terrestrial, invertebrates. Invertebrates make up 95% of all animal diversity so a day in the life of an Invertebrates Collection Manager is never dull. There is always more to learn! Bogan, Arthur E., J.M. Smith, C.M. Bogan. 2008. The H.D. Athearn Museum of Fluviatile Mollusks, Cleveland, Tennessee. Tentacle, 16:14-15. Smith, Jamie M., C Bogan, A.E. Bogan. 2007. Museum of Fluviatile Mollusks Collection Donates to the North Carolina State Museum of Natural Sciences, Raleigh. Ellipsaria, 9(3): 12-14. Bogan, Cynthia, J.M. Smith, A.E. Bogan. 2007. Museum of Fluviatile Mollusks Collection Donated to NC Museum of Natural Sciences, Raleigh. The Naturalist, 15(3): 13. Bogan, Cynthia, J.M. Smith, A.E. Bogan. 2007. Museum of Fluviatile Mollusks Collection Donated to NC Museum of Natural Sciences, Raleigh. NC Shell Club October Newsletter, p 2.